How rare it is to read a biography whose prologue begins with the description of a man’s suicide, but so it goes for Julie Chadwick’s candid and well-researched biography of Saul Holiff, who, for a short and significant time, was the manager of Johnny Cash. It’s an auspicious opening to The Man Who Carried Cash: Saul Holiff, Johnny Cash, and the Making of an American Icon (Dundurn). While the prologue reveals nothing about the relationship between Holiff and Cash, nor fully explains why Holiff took his own life, it does try to set the stage for the story of a struggling country music artist and his Canadian fixer. Holiff was born in London, Ontario in 1925. His mother Ann and father Joel had emigrated to Canada twelve years earlier to escape the growing anti-Semitism of the Ukraine. On top of that, Joel Holiff had been conscripted into the Russian army, as war was looming in Europe. So he and his wife packed up and fled to Canada. According to Chadwick, he was a tough parent to Israel Saul Holiff, who overcame a troubled childhood, which often included relentless bullying by fellow students at his high school. When he was alone Holiff found consolation in Big Band music, especially Artie Shaw. Nevertheless, he felt like an outsider. After serving in the Royal Canadian Air Force during the Second World War, Holiff took a road trip to Vancouver and eventually settled in Hollywood on a veteran’s pass. He was seduced by the glitter and the glamour of Tinseltown, but, as Chadwick tells it, he was also intrigued by the success of “powerful Jewish entrepreneurs, directors, distributors, writers, actors – risk-takers, visionaries – real-life moguls who weren’t ashamed of who they were or where they came from. And they often came from poverty, like him.” A good portion of Holiff’s story is about his search for meaning in the world, and after his stint in Hollywood, his purpose in life came into focus. Packed with facts and straightforward writing, Chadwick's is the portrait of a man who was particularly good at winning over customers. Holiff’s early success in show business provided a lucrative platform for his talent as a businessman and negotiator. In spite of his father’s sternness, at a young age he learned the value of money and how to get a good deal. According to Chadwick, “[t]hough terribly insecure, Saul possessed a unique ability to bluff, to project an outward show of confidence.” One of Holiff’s early successes was Sol’s Square Boy restaurant in London, which became a local haunt for teens in the fifties. Holiff’s negotiating style was an important skill that eventually found him booking rock 'n' roll bands in the London Arena in 1957, which he saw as a new business opportunity. Holiff’s first successful music show was with Bill Haley & His Comets. Holiff handled everything about the concert from advertising to marketing to managing the tickets and paying the band. It was the hands-on experience that was most agreeable to Holiff, a man who really liked having control of a project. He made little money at first, but he forged on, booking the big name, teenage acts of the day such as The Everly Brothers, Paul Anka and Sam Cooke. At the same time a steady number of touring country music acts came into his sphere ,such as Ferlin Husky, Marty Robbins and Carl Perkins, the latter a huge star in both country and rock 'n' roll. As the music grew in popularity, with the help of Top 40 radio, Holiff made regular visits to Heintzmann’s, a record store in London’s busy downtown core. There he sought the knowledge of a young staffer by the name of Dave Roberts, who was tapped into the local music scene and knew what the kids were listening to. Johnny Cash was the name he heard most often, so he caught a show and was amazed at the Cash performance with the Tennessee Two, his back-up band. 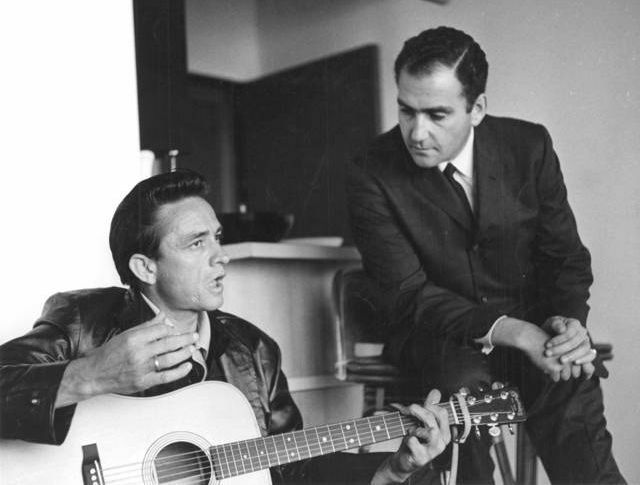 When Saul met Johnny in 1959, Cash was booked to play 15 cities in Canada to promote his latest single, “Ballad of a Teenage Queen,” on Sun Records. Holiff decided to book Johnny’s Canadian tour dates exclusively and arranged a deal with Cash and his manager at the time, Stew Carnall. This relationship was rough at first, since Carnall wasn’t the most reliable person in Johnny’s entourage. Holiff, who believed in Johnny’s talent as a singer and songwriter, thought Johnny could do better. So by 1961 he had become Johnny’s full-time manager, though he didn't know much about Johnny’s drug addiction. Consequently it was a messy partnership from the get-go: Cash was hooked on barbiturates that affected his mood, which was usually irritable, and his overall health. It was an addiction that strained their business relationship for years until he finally kicked the pills in 1968. Chadwick doesn’t criticize Johnny’s music in her book, but she does offer enough some engaging historical facts. For instance, I learned that “Ring of Fire,” the first single I ever owned by Cash, was the most important song on his set list in 1963. It was a tune co-written by June Carter and Merle Kilgore. (By this time Carter was a regular performer on the Johnny Cash Show tour and it was no secret that they were having an affair.) The famous Cash version with the Mexican horn refrain was recorded two weeks after the death of Patsy Cline, one of June’s and Johnny’s personal friends. Produced by Jack Clement, “Ring of Fire” launched the Johnny Cash sound as we know it, even though all was not well between the music star and his manager. Chadwick writes that Johnny was “at times incoherent and erratic” before a performance. One time, he passed out in his motor home “after a week-long binge of pill-popping and sleeplessness, of shattered jars and coffee grounds all over the dressing room” during a concert in Toronto. Eventually he got so bad that he missed appearances altogether, leaving Holiff holding the bag as Johnny became “No-Show” Cash around the country. Holiff wasn’t immune to the stress of keeping his star client on the straight and narrow; his many sleepless nights looking after Johnny started affecting his relationship with his wife and two sons, from whom he became estranged. Yet Cash was gaining momentum as a star on the music scene, under the shrewd guidance of Holiff’s business deals with his label, Columbia, which pushed his mainstream radio success. During his tenure, Holiff was fired on three occasions, only to be brought back into the fold. Cash’s drug addiction was a huge problem for both men. Cash was so hooked on pep pills that he ate them like candy, slowly eroding his health and becoming irrational and irresponsible on many occasions. Chadwick chronicles these stories with precision and a no-nonsense style of writing balanced with pragmatism; the facts are so engaging, no embellishment is required. Fortunately, She doesn’t try to excuse Johnny’s recklessness. Holiff often covered for him, be it before a concert or to Johnny’s first wife Vivian Liberto and their two children, who rarely saw their father at home. Says Chadwick, “[E]very time he gathered up and restacked the pieces of his client’s career, Cash would stride over and kick them over.” She includes dozen of stories of Johnny’s disappearances before shows and describes how he was frequently stoned hours before a concert. By 1966, in spite of Holiff’s efforts to save his client, Johnny bottomed out. One time he needed a fix so badly he traveled across the border to Mexico and was arrested for bringing in illegal barbiturates into the United States. He was arrested and charged in El Paso, Texas. It all came to a head when Cash landed in a jail cell in Lafayette, Louisiana after being picked up by police for “stumbling around the streets” in another drunken stupor. He was recognized by the Lafayette police and put in a cell for his own safety. When he regained consciousness and sobered up the next day, Sheriff Ralph Jones scolded him, “I don’t know where you got your talent from, Johnny, but if you think it came from God, then you’re sure wrecking the body He put it in.” Finally, after years of self-abuse, Johnny got the message. He checked himself into a hospital in Nashville, and decided to clean himself up under the care of Dr. Nat Winston. It worked, leaving him a new man. He kicked the pills and stopped drinking and turned his life to God. His divorce granted him the chance to marry June Carter in 1968 and record his most popular album, At Folsom Prison (Columbia). (Cash proposed to Carter during a concert in London, Ontario.) It was the turning point in the lives of Cash and Holiff as the two men settled into a business and personal relationship that was finally seeing stability and wealth. Nevertheless, though Cash’s career soared, Holiff’s began to unravel as he tried to fight his own demons, especially depression. Using letters and recordings from the Holiff family archives, Chadwick weaves a story so exposed that the very nature of how the two men came together and worked together remains difficult to understand because it was so dysfunctional. Cash was as nasty as he was complementary to his manager in these documented exchanges. As Holiff describes Johnny’s personality he’s “a mystery and a constant guessing game” who often left him distraught and disappointed as his manager. He made financial sacrifices that Johnny never fully understood, like paying for hotel-room damages incurred by Cash. For Holiff, Cash’s career was beginning to fade because he was becoming, to some of his fans, a bit of a religious zealot and only performing gospel songs, taking his music out of the soft-seaters and into revival halls, often under the guidance of Rev. Billy Graham. Cash was on a mission and Holiff couldn’t stop him. Over time it became too much for Holiff to handle so, in 1973, he gave five months' notice that he was quitting. As Chadwick argues in her book, Saul Holiff was personally responsible for bringing Cash into the mainstream in the sixties when country music was still considered, by some insiders, a ghetto for progressive songwriters such as Cash. He made deals that worked in Johnny’s favour most of the time (peaking with the single “A Boy Named Sue”), but the strain of maintaining the skyrocketing career of an unpredictable artist became too difficult, and Holiff suffered for it psychologically. When he quit in 1973, at age fifty, he returned to school to complete a degree at the University of Western Ontario, in London. During his studies, which included religion, Holiff often shared his essays about the Old Testament with Cash ,who was also taking Bible Studies in between gigs, so they were able to make peace in this way. In fact, Johnny was quite grateful for Saul’s efforts during his career, according to Chadwick. 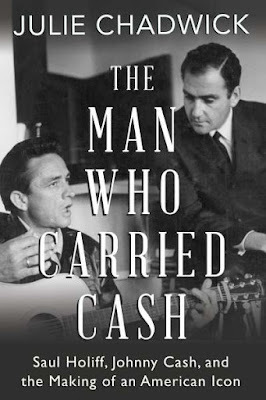 The Man Who Carried Cash: Saul Holiff, Johnny Cash, and the Making of an American Icon (Dundurn) is a must-read for anyone interested in the life and career of Johnny Cash and the man who truly made it happen for him. Like that of Brian Epstein, who put four rough-and-ready lads from Liverpool into suits to make them more appealing to a wider audience, the story of Holiff’s sharp business acumen and astuteness as he managed Cash's career is highly significant in the history of music. It’s a pity that both Epstein, who died from a bad mixture of pills and alcohol in 1967, and Holiff,who found his own way out in 2005, weren’t as stoic as their clients. Chadwick’s impeccable research, including Holiff’s recorded archives and letters provided by Holiff’s son Jonathan, offers great insight into the music business of the sixties from a rarely-heard perspective. By the way, Holiff really carried cash money in his briefcase for payouts.